With winter only 2 days away our food thoughts turn towards warm and comforting classics. Yesterday I shared my Cottage Pie with Sweet Potato and Cauliflower Crust as an example of how I try to lighten up one of our regular midweek meals. Today I have a few other classic dinners that I have given a healthy makeover. Don't worry, I'm not talking about doing things like replacing all carbs with lettuce; just some easy substitutions that mean you still feeling like you are eating your favourite comfort food but you can feel okay about eating dessert afterwards! My husband often says his favourite meals consist of 'meat and bread'. Think hamburgers, crispy chicken wraps, pizza and BBQs. I also thoroughly enjoy these meals and although we are equal in appetite, our metabolism and activity levels are definitely not made equal. So these are some ways I try to lighten up some 'meat and bread' midweek meals. Classic Comfort Version: I use Stephanie Alexander's lasagna recipe with full bechamel sauce (flour, butter, milk). Healthy Family Version: I replace the bechamel sauce with a sauce made from ricotta, egg and milk. I add carrot, mushrooms and lentils to the lean beef mince mixture. I promise you'll have no idea the lentils are in there! Healthiest Version: I roast eggplant, pumpkin, red capsicum, mushrooms and zucchini. I use two lasagna sheets to form the bottom and top layer on my half of the lasagna and use the roasted vegetables to form the other layers in between. I still use some of the mince mixture on my side to make sure it still tastes like a classic lasagna - you don't need to use too much to get the full flavour. The roasted veggies only adds an extra 5 minutes to the preparation - all you do to slice the vegetables and place on baking tray and roast while the mince is simmering. 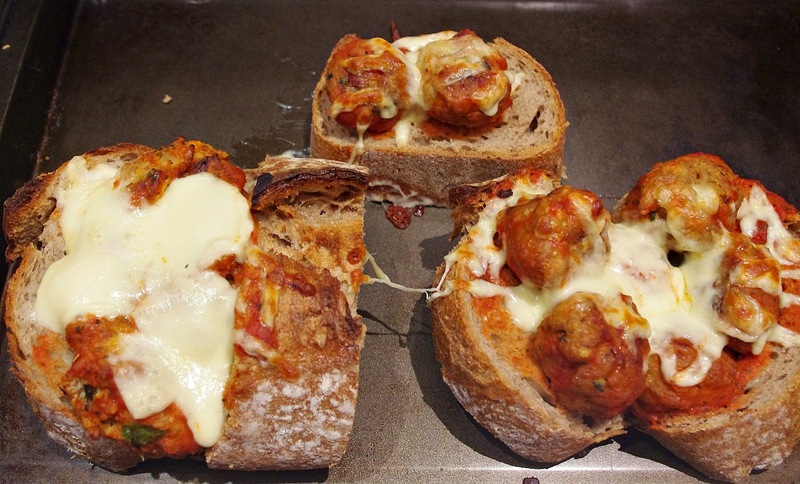 Classic Comfort Version: White crusty bread with meatballs made from a mix of veal and pork mince topped with mozarella. I use this great recipe from David Lebovitz. Healthy Family Version: I use a rye flour sourdough for the bread, lean beef mince for the baked meatballs while still using the above recipe and adding grated zucchini or carrot to the meatballs. I also serve it with a corn cob and some steamed vegetables. Healthiest Version: I still use the above recipe but I put 450g of turkey mince in one bowl and the beef mince in another bowl and then just split the rest of the ingredients between both bowls. It makes enough to freeze half for another meal and still only takes the same amount of time. I also use oat bran instead of bread crumbs. I sliced a bocconcini ball for the cheese topping and removed some of the bread from the middle of the roll. I also made sure I had a smaller portion size - the proportions look a little skewed in the photo, I promise I did have a smaller serve, not something I am known to do! Classic Comfort Version: A Greek Lamb and BBQ chicken pizza from Lindos. Yes, we drive 40 mins return for our favourite pizza! Healthy Family Version: We use pita bread for the base, cook up chicken breast in cajun seasoning and roast some pumpkin. We top the pita bread with a commercial pizza sauce, top with roasted pumpkin, chicken, mushrooms and tomato and finsh with some pizza blend cheese. Healthiest Version: I split the pita bread in half to make two bases from the one pocket. I top with passata, chicken, pumpkin, sun dried tomato and feta cheese and finish with baby spinach leaves. And finish with a slice of Healthy Hummingbird Cake! 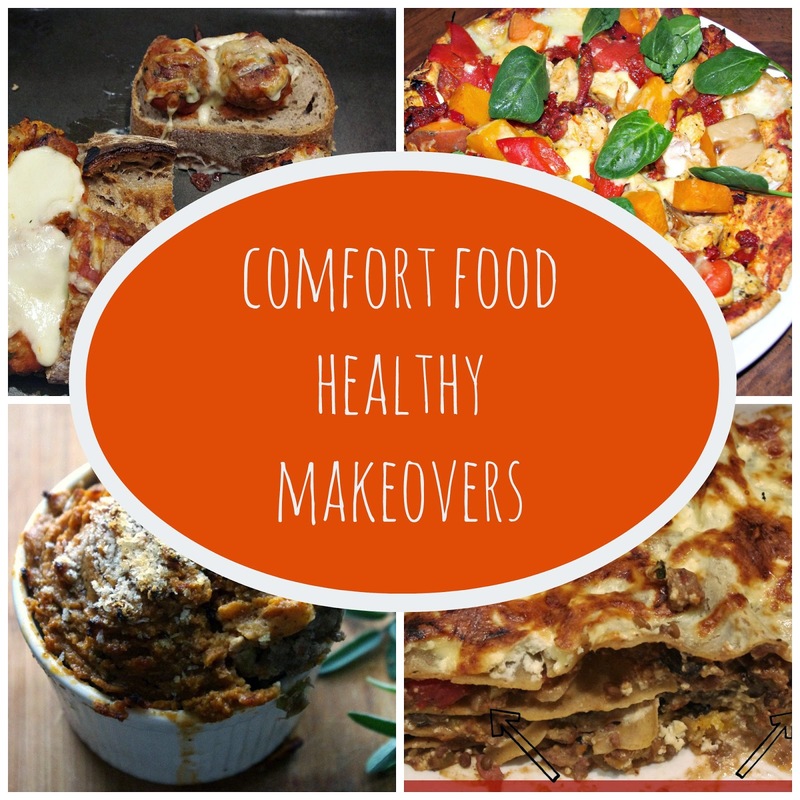 Tell me, which meals do you like to makeover? Linking up with Katie Did What for Healthy Habits! ooh that pizza looks so good! it's my go-to comfort food, but i'm sure i can make it over & have it work! also, i'm obsessed with feta and spinach, so it shouldn't be too difficult, right? Spinach and feta always works and if it gives us guilt free pizza, it is definitely worth a shot! Thanks Katie, lasagna is always a winner in this house too. It was my birthday meal for a long time! Thanks for hosting a great link up.